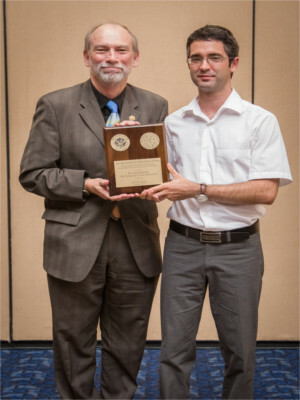 Simon Banville, a Ph.D. geodesy and geomatics engineering student at the University of New Brunswick, was awarded this year’s Institute of Navigation Bradford W. Parkinson Award. The $2,500 honorarium and plaque was presented recently during The Institute of Navigation’s GNSS+ meeting in Tampa, Florida. The Parkinson Award recognizes an outstanding graduate student in the field of global navigation satellite systems, such as the Global Positioning System. The winner is selected based on the theses and dissertations submitted by supervisors from the global GNSS research community. Banville was selected for his outstanding contributions that represent truly significant innovations in the technology, application, or policy of modern satellite navigation systems. Supervised by UNB’s Dr. Richard Langley, his dissertation is entitled Improved Convergence for GNSS Precise Point Positioning. The award honours Dr. Brad Parkinson for his leadership in establishing both the U.S. Global Positioning System and the Satellite Division of the ION. Precise Point Positioning or PPP is a relatively new single-receiver positioning technique that uses precise information on the orbits of navigation satellites and the atomic clocks they carry along in a rigorous mathematical model for analyzing receiver measurements. It permits positioning accuracies down to the few-centimetre level and Mr. Banville’s improvements to the technique will have significant economic benefits for those using GNSS in high-precision applications. Banville will receive his Ph.D. degree at UNB’s Fall Convocation next month.